I was excited about this cereal. I'm a fan of Lucky Charms and a fan of chocolate... so to see our leprechaun friend surrounded in a vibrant cocoa brown on the box... gave me a thrill. Chocolate Lucky Charms is a very sweet cereal. The overriding flavor is one of sugar more than chocolate. The dark brown nuggets and the already-familiar marshmallows really want to work together... but they don't. It tastes like you combined two cereals more than one great combined flavor. It's not a bad cereal and it will probably fill your morning craving for a sugary breakfast cereal... but don't expect any lasting impression. With all the choices we have for breakfast cereal, I wouldn't buy this one again. For a 1 cup serving without milk: 0 saturated fat. 0 trans fat. 120 calories. What do you think of Chocolate Lucky Charms? I didn't ever eat Lucky Charms until Chocolate Lucky Charms came out. Now I like both. I love these when ever I go over to my friends house they are totally awesome!!! Yum... This kind of Lucky Charms was Heaven on Earth! 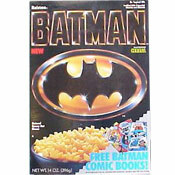 When I had this cereal I thought I was eating stale marshmellow & artifical chocolate flavor. Gross.! LOVE THIS STUFF! So hard to find though so I have resort to buying on Amazon. I love CLC!! Why can't I find it in stores??! Bring my fav cereal back... now! Boo hoo! Aaaah I LIVE FOR THIS STUFF!!!! Why didn't they have this when I was a child ? New obsession. Conversely, I was caught off-guard with the new formula of CLC. The new recepie is SUPER...WAY better than the (already good) prior version. I only had about 1 bowl left in the box, so I went to my grocery store and bought 2 more. Unfortunately, they are the older type without the crunchier oat pieces and glaze. I'm hoping that my local store failed to properly rotate the boxes and some newer product slipped out before the old stock was depleted. Keep the new recepie, please. I LOVE CLC!! I just moved to another state 2 months ago and have not been able to find it yet. :( Hopefully they do something soon! Great munchy food! 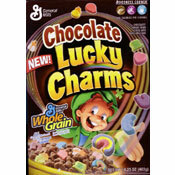 I have tried the new Chocolate Lucky Charms the past 2 days and I think it is absolutely HORRIBLE now! They have changed something with it, the chocolate is covered in yucky sugary stuff and tastes really really bad. They just lost a CLC fan who would eat NOTHING but CLC every morning for breakfast. Now I have to find another cereal to eat. Thanks for nothing. The CLC used to be so good and not taste like all the other badly processed cereals and now they are just like all the other guys. The latest box (with hourglass marshmallows) has changed. The chocolate oat bits are now sugar coated with a glaze rather than brown and porous like before. The forumla has changed and the resulting taste difference is a diaster. REally a waste of money. I even think this is better than Cocoa Pebbles, which was the best cereal ever. This cereal is the best if you're compulsive like me, and always ate the oats before the marshmallows. Now - The oats don't seem like penance for the upcoming teeth-chattering marshmallow goodness. We did not like this cereal. Luckily we only paid 50 cents for the box. The kids (ages 8, 6 and 1.5) did not enjoy it at all. The oldest said it tasted "weird". Maybe ok as a dry snack, maybe. I think it is safe to say Lucky Charms is the best cereal ever, this website doesn't know what its talking about. The only bad thing is I can't find them anymore. Basically with the AMAZING creation of finally making the little bits chocolate flavored kids wont just pick out the marshmallows lmao .....and not to mention im eating eat right now its its the best cereal on the market...besides cinni buns but they no longer make them. I consider it more of a treat than a regular breakfast but my husband and I (both in our 30s) think this is the best cereal ever. I never buy cereals like Lucky Charms for breakfast, I'd be twitchy the rest of the day if I ate it for breakfast. As a midday snack, this cereal was good, but I like regular Lucky Charms much better. I like the oaty flavor of the original pieces, that gets lost in the "chocolate" of these. Overall, if I had this in the house I'd eat it, but if I was staring at this and regular Lucky Charms at the store, I'd buy the original. My son is 17 and nephew is 14... they both love your new chocolate lucky charms... said it was the best ever!!! but I''m having a hard time finding it ... was it just a special or what?